Frank Ocean once posed the question: “What’s a god to a non-believer?” The self-proclaimed rap god Eminem must have thought about those lyrics when he put together his 10th album, Kamikaze. The cover displays his love for his musical forefathers and idols, the Beastie Boys, to show what kind of album this is going to be. He mulls through the rap world as the old man in rap years who doesn’t have what it takes anymore. He laments the rappers who once idolized him like Machine Gun Kelly and Joe Budden who now take shots at his place on rap’s Mount Olympus. Will he smite the people who once believed he was a deity, or prove that he’s over the hill and shouldn’t pick up the mic again? He does both in this new album. Kamikaze starts off with Eminem reflecting on his last musical projects not having the impact his late ‘90s, early 2000s music catalog had when he dominated the music industry. It might come across as a bitter old man ranting about why things aren’t the way they used to be. But he brings up valid reasons why rap is watered down — nobody wants to be original, and lyrics are taking a back seat to nursery-rhyme songs. Eminem’s alter ego Slim Shady returns on “Greatest.” He is in rare form when he disses his naysayers and puts it all out there to show why he’s still one of the greatest emcees to pick up a microphone. Upcoming rapper Joyner Lucas joins Eminem on “Lucky You.” The track is a lackluster effort especially when you can barely tell the two artists apart when rapping. The highlight of the CD is when Eminem bares his soul about his friends and rap crew from Detroit on the track “Stepping Stone” from admitting he could’ve done more for his friends to being more successful in the music business and being an all-around better friend throughout the years. He laments his rap group falling apart when rapper Proof was killed. He also regrets not being a businessman and feels like he used his friends as a stepping stone. The forgettable track “Not Alike” features Royce da 5’9,” an uninspiring production from Tay Keith. The goal of this track was to try to bring lyricism to today’s hip-hop climate, which favors simple lyrics and hooks but fails due to it not being their sound. 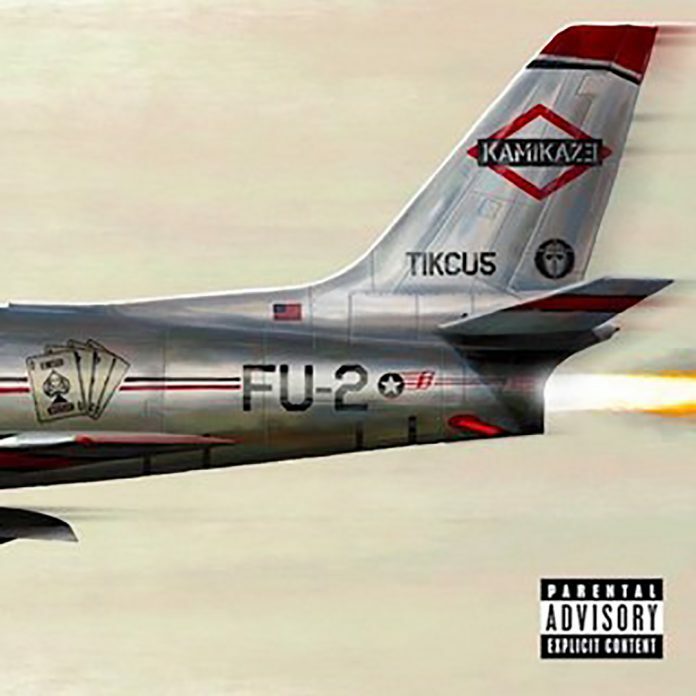 The track “Kamikaze” brings back Slim Shady in these Beastie Boys-inspired tracks, which sounds like it could’ve been on his second album while not dated. He closes out this CD with three more similar tracks. With more songs like “Stepping Stones,” this could’ve been the rapper’s magnum opus. Apart from a couple of missteps, this album is a solid effort. He has nothing left to prove in the game of hip-hop.